"Why should we be peaceful when our killers never are?" The above lines are from a song I wrote a few days after an unarmed, 18-year-old Michael Brown — a week away from attending college — was shot and killed by police officer Darren Wilson in Ferguson, Mo. As Mike lay bleeding in the street, he was given no first aid and no ambulance was called. He was left in the street, in the middle of a community that loved him, for over 4 hours. His body wasn't even covered up. This is terrorism — a truly American form — that, sadly, my community has experienced for many years. Just a few days following Michael Brown's murder, which was the first homicide of the year in Ferguson, 25-year-old Kajieme Powell was shot multiple times and killed by two St. Louis police officers. Even though Kajieme possessed only a small knife, both officers opened fire. As his limp, bullet-ridden body lay in the street, the police officers proceeded to roll him over and handcuff him. Two months later, an off-duty St. Louis police officer shot 17 times at 18-year-old Vonderrit Myers Jr., hitting him six times in the back and killing him. The St Louis Police Department said Vonderrit had a gun, although his DNA was not on the gun they recovered at the scene. Witnesses said Vonderrit had only a sandwich and begged the officer for his life. 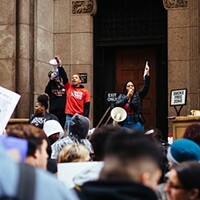 Around the same time Michael Brown was killed in Ferguson, Eric Gardner was choked to death by New York police officers (captured on video); John Crawford was shot to death in a Walmart in Ohio for holding a toy gun; and Ezell Ford was shot in the back and killed by Los Angeles police officers. According to a report by the Malcolm X Grassroots Movement, a black person is killed by a police officer, security guard or vigilante like George Zimmerman once every 28 hours. We've seen these numbers play out in the last few days with the killing of another unarmed man, Akai Gurley in the stairwell of his apartment building by the NYPD, and the killing of 12-year-old Tamir Rice by a Cleveland police officer. Tamir had a BB gun and officers shot him seconds after approaching him in a squad car responding to a 9-1-1 call that said he had a gun that was "probably fake." A recent study by ProPublica showed that black teens are 21 times more likely to be killed by cops than white teens. Darren Wilson isn't an anomaly; neither is the killing of Michael Brown. It's a fact of life you have to deal with if you are black in America. I didn't expect Officer Wilson to be indicted. Why would I? The Pittsburgh police officers who shot and paralyzed an unarmed Leon Ford haven't even been charged. The response of the community in Ferguson wasn't surprising either. Why should we be peaceful when our killers never are? We've been peacefully protesting for the last 60 years, and we're still being killed by police with no justice on the horizon. If we can be shot down with our hands up, maybe being peaceful isn't the answer. Public Enemy famously stated in their seminal album It Takes a Nation of Millions to Hold Us Back — "I got a right to be hostile, my people been persecuted." Today, we have a right to be hostile, our people are being executed. Sadly, some are more concerned about our justified anger than about unarmed men, women and children being shot down by officers sworn to protect us. 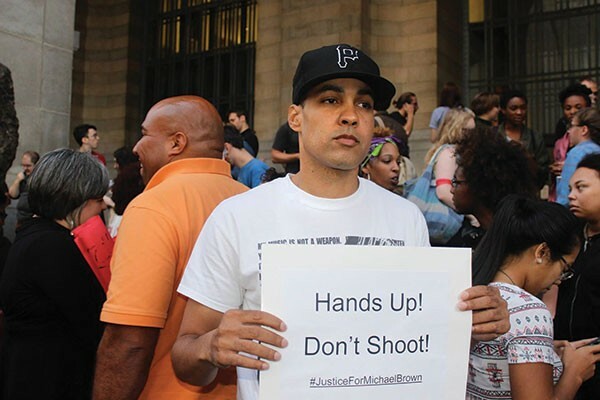 Jasiri X is a local hip-hop artist, community activist and founding member of the anti-violence group One Hood.